Loxahatchee, FL – For Heidi Degele, having both High Point Horses for both shows at the Wellington Classic in the Tropics I & II, July 20-21, at the Jim Brandon Equestrian Center in West Palm Beach, FL, is just the way to round off a string of wins and qualifying scores leading up to the 2013 Young Horse Championships at Lamplight. Degele has successfully qualified two promising young horses for the Championships, and a weekend of good luck was an excellent stepping stone to put her mounts in top form to compete against some of the nation’s most talented young dressage horses. In addition, Degele did very well with Lionwood Kinsales Lad, an 8-year-old Irish draught stallion owned by Kenneth Haley, and the pair have scored up to 65.3% in the Intermediare I. Degele also rode Kyle McIver’s Haute Couture, aka ‘Hoppy,’ to the win in Sunday’s USEF Training Level Test 2 with a 67.857%. McIver bred Hoppy in the United States and competed her dam, Godiva (by Airport), successfully through the Grand Prix. Both she and Degele are excited to see what the future holds for Hoppy; the 16.2hh Hanoverian mare is by Royal Prince, and her barn name ‘Hoppy’ was given to her as she was born on Easter morning. “All my thanks for the wonderful young horses I have goes to Jessica Beier of Greystone Equestrian LLC, Kay Moss, Kenneth Haley, and Kyle McIver,” said Degele, who owns and operates Mesa Farms in Loxahatchee, FL. “I am proud of all my horses and so excited for their futures, especially Lakota and Don Fredo HD at the upcoming Young Horse Championships,” said Degele, who fine tunes her skills through regular training with Lars Peterson, and clinics with international masters such as Hubertus Schmidt, Steffen Peters and Conrad Schumacher. 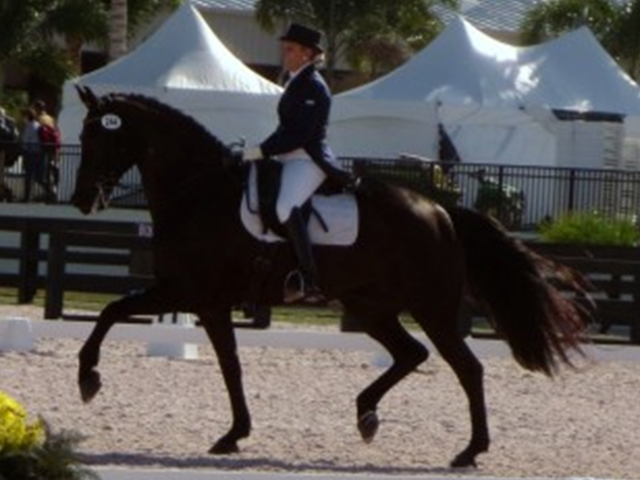 Degele trained under Schmidt for three (2004-2007) years in Germany with her stallion, Ramiros, and under his tutelage, brought Everybody’s Darling, a Third Level mare purchased while she was in Germany, through Grand Prix to get her USDF Gold medal. Mesa Farms is Heidi Degele’s year-round training facility where adult amateurs can bring horses for training in the best German and American dressage foundations. She is also available for individualized training, sales and clinics, and is among an elite group of dressage riders and trainers selected as a Custom Saddlery ambassador. For more information on Heidi Degele and Mesa Farms, please visit www.heididressage.com.